Windows 7 users have a lot of personalization options right at their hands, without having to modify system files to do so. These basic themes make a handful of modifications to the system, they change the wallpaper, sounds or cursors for instance, but leave the rest of the interface alone. Full conversions and custom themes on the other hand require the manipulation of system files, which many users may shy away from. 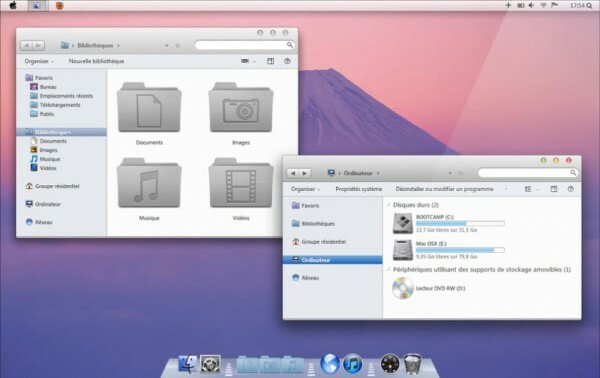 This guide explains how you can install a Mac OS X Lion theme for Windows 7. Lets start with the requirements. The first thing that you need to do is to download the UXTheme Patch program. It is compatible with 32-bit and 64-bit Windows 7 and Windows 7 SP1 systems. Start the appropriate version (there is one for 32-bit and one for 64-bit systems), and click on the Patch icons to patch the three system files. You can use the program later on again to restore the original file versions. The changes take effect after a restart of your computer. CustoPack Tools has been designed to make the installation of themes easier by installing them as packs. The Mac OS X Lion theme is such a pack, and you need this program to install it on your system. You can download the free CustoPack Tools from the official website. There you also find additional themes in the gallery in case you are interested in those. Make sure you pay attention to the installation dialog, as you may end up with the Ask Toolbar otherwise. If you do, check out how to remove the Ask Toolbar here. Please note that you need to have a full Aero theme running before you can install the Mac theme on Windows 7. While the installation will complete just fine if you do not, you will end up with only half of the theme installed. Now that you have installed all the prerequisites, you can install the Mac OS X Lion theme for Windows 7. Download it from its Deviant art project page and extract it to a directory on your computer. Switch to the themes Setup folder and start the installation by executing the Mac OSX Lion Inspirat (Transformation Pack).exe file. You will notice that the CustoPack interface is now loaded. The author suggests you select the full installation, but you can theoretically block parts of the conversion from being installed. If you do not like Rocketdock for instance, you can block the installation quite easily in this step. For a total conversion, you should install all theme components though. Just follow the instructions to install the OS X theme on your system. Please note that you need to make a final restart after the installation before you will see the theme in all of its glory on your computer. You repeat the same process, only backwards. Start CustoPack (for instance from the start menu), and select the Choose a CustoPack option in the main interface. Select Default Windows theme there by hovering your mouse over the theme and selecting the restore option that is displayed afterwards. Uninstallation may take a while, and you will have to restart your computer to finalize it. The second thing that you need to do after your computer reboots is to restore the patched system files. 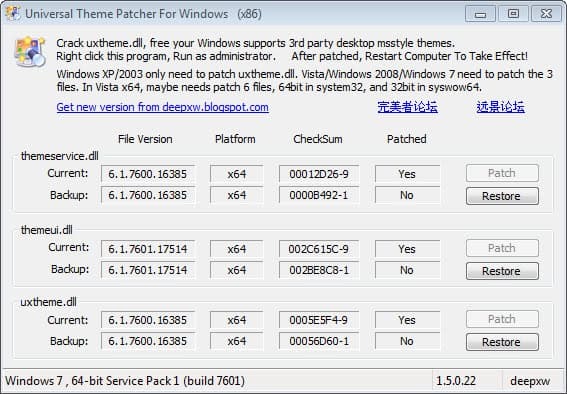 Start the UXtheme patcher file again and select the restore option this time.